The first thing that I am going to say about this book is that it is definitely high on my list of favourites, and that it makes the top 15 favourite for the year. The second thing that I am going to say is that is hilarious. Frankie, or should I say Frances, has always been her father's 'bunny rabbit'. But after a summer of change, jaws are dropping and Frankie is back and badder that ever. Attending the prestigious Alabaster boarding school, Frankie has always flown under her sister's shadow and under the radar; and she liked it that way. The Disreputable history of Frankie Landau-Banks is the first book that I have read by E Lockhart and I have to say, I'm hooked. The Plot is fabulous, an original spin on secret societies/ clubs. I loved the completely outrageous things that Lockhart came up with - they were hysterical. Lockhart uses real language and situations but puts a comedic twist on them, this makes you feel comfortable in the situation, yet laughing at Frankie's adventures. The main character Frankie is definitely one of my favourite characters out of all the books that I have read. Inquisitive, genuine, down to earth and just plain hilarious, The disreputable history of Frankie Landau Banks captures your attention and holds it until long after the sadness of the book ending. 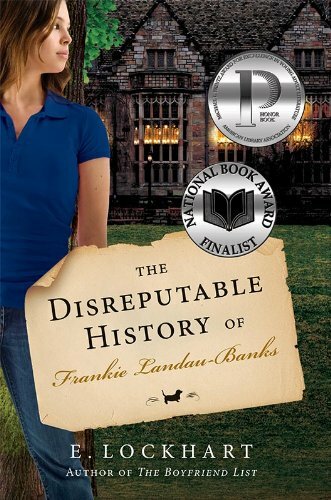 I would love for Lockhart to continue Frankie's story in another series or companion novel, but all around, The disreputable history is definitely a novel on the top of the charts. Girls 13-16 would enjoy this. It's a light read that will have your eyes glued to the page. Read It. Right Now! Ooh, this sounds great! I've read E. Lockhart's Ruby Oliver series and loved it, so hopefully I'll like this just as much! Thanks for the review - glad you liked it :).